Brochures, booklet and catalogues come in all shapes, sizes and paginations so what the difference between them? Not a lot is the answer. Brochures tend to contain marketing material promoting a company, product, service or brand so are usually high quality. Booklets are usually information guides or manuals and often produced more with budget in mind than branding but otherwise very similar to brochures. Catalogues are again very similar but are aimed at promoting and selling a large range of products and tend to have many pages. So if they’re so similar can the same print supplier who prints our brochure print a catalogue? Well they probably could but not in the most efficient and cost effective way. In fact the printer who produced a 1000 brochures when you first started marketing your business is most probably not the best supplier for your increased order for 10,000 brochures now your business has grown. Newsletters, Magazine printing and newspaper printing are very similar in their makeup yet once again often better produced by a printing company specifically tailored to their production. This is where a professional print buyer comes in handy. Better known as a print broker or Print management company like ourselves we know exactly which printers to use in each and every scenario. As we already mentioned, brochures come in many shapes and sizes ranging from miniature pocket size media up to large broadsheet size brochures. We were even asked to produce an A1 brochure a few years ago by an art student but in the end the price made it prohibitive. Simplified a brochure is a piece of paper with ink printed on it but in reality it is so much more. First impressions are what counts in business and besides your sales rep, your brochure is often what forms the first impression of your company. If you want to stand out from the competition your brochure needs to be GREAT! You’ve put your life and sole into your business and work hard at what you do. Now you need someone you can rely on to ensure you carry that professionalism to your target audience. We can help! Get in touch to discuss the which options can set you above the competition with your marketing. We can help with design idea’s or even take care of your brochure design altogether. At the very least we can go through your brief with you and make some enhancement suggestions such as die cutting, foiling, Spot UV and many other specialist print finishing techniques. Much like brochure printing, booklets reflect the image of your company. 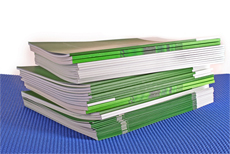 Just how much effort and expense you invest in your booklet printing will depend very much on the purpose of the item. Is it an information booklet to inform your clients terms and conditions of a service they have taken out with you? If so you will most probably want it to carry the same professionalism and branding as your brochure but perhaps on slightly less expensive paper and without the enhancements such as lamination and die cutting? If however the purpose of the product if for internal communication, training manuals for example you might consider a much cheaper method of production. Thinner paper still and perhaps black and white instead of colour print? Once again you can see how the printer who produced you a fantastic all singing, all dancing colour brochure may not be best suited to print this black & white internal communication manual. Of course all print jobs and print requirements are bespoke but generally speaking catalogues are much thicker books with high paginations (lots of pages). Due to the machine set ups involved these kind of catalogues generally have a better quality cover but use much thinner material for the text pages. On a run of 10,000 or more the text pages are often printed on a web offset press and the cover on a litho sheetfed press which may require the input of two different print providers. In these instances the customer would have usually have spoken to the web printer who would in turn have outsourced the cover printing to his preferred sheetfed printer. The problem with this scenario is that there isn’t as much room for negotiation. When a print broker or print manager outsources your work they will tender the project and obtain the best prices from three or four suitable suppliers, splitting the project requirements where necessary.